Dermatitis artefacta (DA) and trichotemnomania are self-inflicted dermatoses often preceded by psychosocial stressful events. A 38-year-old female presented with sudden loss of hair in the right frontal area along with discoloration and edema of skin. On examination, there was complete loss of hair involving the right frontal area and the lateral half of right eyebrow with skin over that area appearing scalded, edematous, bruised, and discolored. After a detailed medical and psychological evaluation, a clinical diagnosis of DA with trichotemnomania was made. A tactful multidisciplinary approach is essential in managing such patients as outright referral to a psychiatrist could be counterproductive. Dermatitis artefacta (DA) or factitious dermatitis (FD) is an artefactual disease caused entirely by a fully aware patient on the skin, hair, nails, or mucosa. Most of the patients are young females aged between 15 and 30. FD or DA has to be distinguished from malingering by “sick role” seeking commonly seen in DA in contrast to external incentives acting as the motivating factor in malingering. We report a case of DA in a 38-year-old female with localized alopecia of the right half of eyebrow and anterior part of right side of the scalp. A 38-year-old lady presented with sudden loss of hair on the right side of the scalp with discoloration over the right forehead extending to the right eyelid along with edema of right eyelid of 1-day duration. She complained of ear discharge from the right ear 2 weeks back and subsequently developed tingling and numbness on right side of forehead and scalp. She also complained of occasional attacks of excruciating pain in the same area for which she took analgesics without much relief. She consulted a physician who advised a computed tomography (CT) scan of the head which was normal. There was no history of seizures. She denied application of any topical medications at the site. While eliciting clinical history, she appeared disinterested and kept her eyes closed. On further inquiry, her sister disclosed that her husband was an alcoholic, and they had some financial problems. There was no history of any injury or assault before the onset of the skin lesions. On general examination, the patient was conscious but appeared uncooperative and disinterested. An area of 15 cm × 10 cm on the right side of forehead extending to involve the right eyelid and right pinna showed areas of bruising, scalding, edema, and discoloration. There was complete loss of hair involving the lateral half of right eyebrow and anterior part of right frontal and temporal areas [Figure 1]. There were no broken off hairs or burnt or charred hairs seen on the affected area or on the periphery of the lesion. The conjunctival mucosa of the right eye was congested. Hair pull test and hair microscopy of hairs from the margin of the lesion and eyebrows were normal. No bubble hairs were seen on hair microscopy. A detailed medical and psychiatric evaluation were done. The recurrent right sided paresthesia and pain suggested the possibility of trigeminal neuralgia involving the right ophthalmic division. On psychiatric evaluation, the patient appeared emotionally disturbed. Complete hemogram, liver function tests, renal function tests, and thyroid function tests were within normal limits. CT scan of the head was normal. A final clinical diagnosis of DA with trichotemnomania was considered. We had planned a detailed psychiatric evaluation and psychotherapy, but the patient got discharged at request and failed to come for follow-up. A clinical diagnosis of DA is made when the clinical presentation of the skin lesions do not conform to those of known dermatoses and are located on easily accessible parts of the skin. In our patient, trigeminal neuralgia along with family problems could have acted as triggering agents for this compulsive act. The right side of scalp and forehead were easily accessible areas but an extension of the lesion to involve the right eye was probably unexpected. Trichotemnomania is a compulsive behavior of cutting or shaving of one's hair. Burnt or charred hairs were not seen in the affected area nor were bubble hairs seen on hair microscopy. 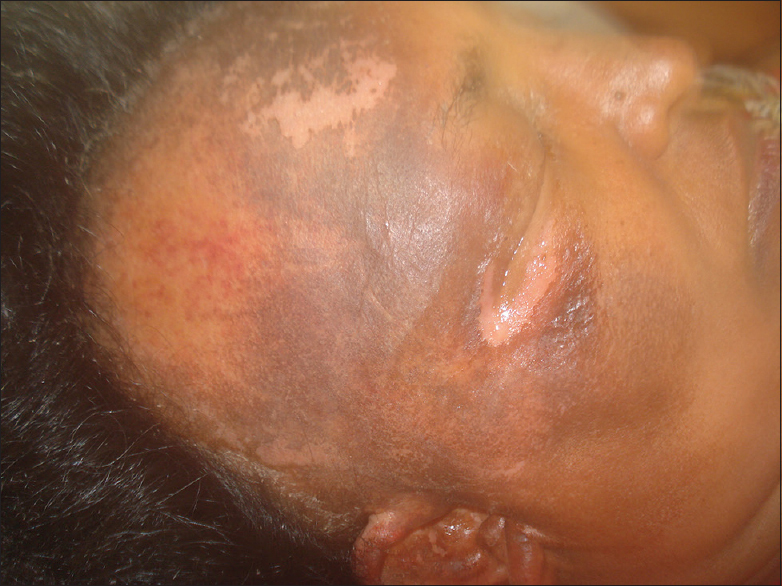 Broken off hairs of different lengths and exclamatory hairs were absent thereby excluding the possibilities of trichotillomania, trichoteiromania and alopecia areata., Trigeminal trophic syndrome (TTS) presents with self-induced facial ulcers usually involving the ala nasi associated with anesthesia and paresthesia often following surgical interventions or central nervous system disorders of trigeminal ganglion. The hollow history characteristic of FD and the absence of sensory loss helped us to exclude TTS. The well-demarcated area of hair loss of sudden onset is suggestive of shaving off of hairs before traumatizing the area possibly with some hot object. The unique feature of our case is the coexistence of two self-inflicted dermatoses involving the same site. Hysterical type of personality is commonly seen in women with DA. An association has been described with impulse control disorder and obsessive-compulsive disorders., Trigeminal neuralgia with depression has been reported as a precipitating factor for DA in one of the 28 cases studied by Mohandas et al. These patients may be unwilling to acknowledge a psychiatric basis for their physical findings and hence, a trichologist needs to spend time probing into the psychological background as patients often tend to deter a psychiatric referral. The serotonin pathways are involved in the self-injurious behavior and obsessive-compulsive disorders. Therefore, selective serotonin reuptake inhibitors are used to treat these disorders along with psychotherapy. Doctor should avoid immediate confrontation regarding the suspicion that the lesions are self-inflicted. In our patient, although we tried to avoid questions, which could evoke a suspicion that we were suspecting a self-inflicted cause for the skin lesion, patient and close relatives became uncooperative the moment we suggested a psychological evaluation. A more tactful approach is needed in such cases as a psychiatric referral, especially during the initial visit is counterproductive. A multidisciplinary holistic approach is necessary in managing such patients. Potenza C, Bernardini N, Mambrin A, Skroza N. Dermatitis artefacta in a patient affected by impulse control disorder: Case report. Acta Dermatovenerol Croat 2011;19:28-30. Dahale AB, Hatti S, Thippeswamy H, Chaturvedi SK. Factitious disorder-experience at a neuropsychiatric center in Southern India. Indian J Psychol Med 2014;36:62-5. Happle R. Trichotemnomania: Obsessive-compulsive habit of cutting or shaving the hair. J Am Acad Dermatol 2005;52:157-9. Freyschmidt-Paul P, Hoffmann R, Happle R. Trichoteiromania. Eur J Dermatol 2001;11:369-71. Orgaz-Molina J, Husein-Elahmed H, Soriano-Hernández MI, Arias-Santiago S. Trichotemnomania: Hair loss mediated by a compulsive habit not admitted by patients. Acta Derm Venereol 2012;92:183-4. Elloumi-Jellouli A, Ben Ammar S, Fenniche S, Zghal M, Marrak H, Mokhtar I. Trigeminal trophic syndrome: A report of two cases with review of literature. Dermatol Online J 2003;9:26. Mohandas P, Bewley A, Taylor R. Dermatitis artefacta and artefactual skin disease: The need for a psychodermatology multidisciplinary team to treat a difficult condition. Br J Dermatol 2013;169:600-6.